Home » a lot? » Have you ever had a “reality challenge” from someone you liked and respected » Have you ever had a “reality challenge” from someone you liked and respected, a lot? Have you ever had a “reality challenge” from someone you liked and respected, a lot? Title: Have you ever had a “reality challenge” from someone you liked and respected, a lot? Perhaps that person is yourself hidden deep inside you. Maybe it made an observation about your life, or “called you out” for clinging to a particular excuse when you’re capable of so much more. We don’t always “enjoy” these little wake-up jolts. Sometimes, the truth can be painful. But from time to time? We all need a reality challenge. We need an interior voice to hold us to a higher standard of behaviour — or else we tend to fall short of our real potential. You were born to be happy, to be healthy, and to contribute to the world in a meaningful way. That’s what your child within wishes for you -- and yes, will support you in your happiness at The Stages. You might be a manicurist. You might be a unemployed. You might a mental health problem, you may be addicted to a substance or a behaviour, life coach, a yoga teacher or the director of a meditation centre. No matter what you do (or dream of doing), you have skills and abilities that can make your child within s life better. It is our responsibility — as a human being — to bring our skills and abilities to communicate with the support of others our child within. 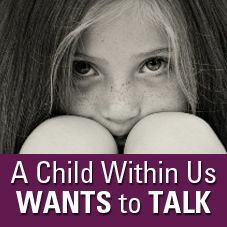 It is our responsibility to relearn to communicate with our child within to release our childs intuitive voice at the highest possible level, helping people, teaching people, inspiring people, at every possible opportunity. If you hold back — by hiding, procrastinating, giving just 80% of your capacity, or refusing to contact your child within — you are essentially stealing from the people who need you most. theft of our peace, our serenity our unlimited potential. Tough to hear — but true.